Is Explosion Safety Important on your Site? 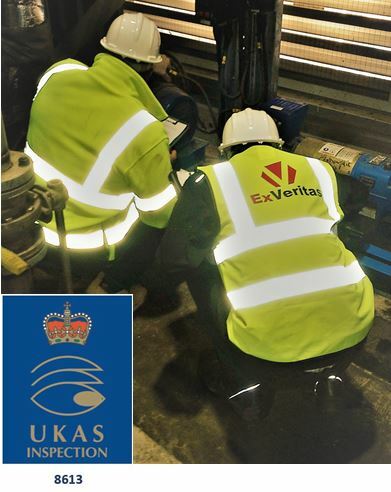 ExVeritas holds UKAS accreditation against the requirements of ISO/IEC 17020:2012 as a Type A inspection body in the field of Ex Inspections, as identified in International, European and UK legislation. This accreditation ensures that Ex inspections undertaken by ExVeritas, as part of the Explosion Protection Document (EPD) requirements of ATEX “User” Directive (DSEAR in the UK), satisfies the stated competence requirements of the Directive. We issue fully UKAS accredited internationally recognised certificates for hazardous area Ex Electrical Inspection, Ex Non-Electrical Inspection and Ex Repair Verification. UKAS is the national accreditation body responsible for determining the technical competence and integrity of organisations and their compliance as an Inspection Body to ISO17020. UKAS assesses and accredits the competence of inspection bodies to operate in specified fields and perform various types of inspections. This ensures that the required standards are maintained. We are accredited to conduct and issue UKAS Certificates for Initial, Periodic Inspections of types Detailed, Close and Visual. We are also accredited to verify repairs to BS EN 60079-19 and to issue certificates as a ‘Certification Body’ for ATEX/IECEx rigs, skids and mobile/modular plant. For International Customers the UKAS Certication is internationally recognised (ILAC). Our inspectors are experts in both electrical and mechanical Ex inspection and our inspectors are certified to CompEx EX01-06, EX11, EX12 and EX14. ExVeritas consultants are verified experts in the field of Ex Inspection & Installation as required by the ATEX/DSEAR Directive for EPD Sign off. We have extensive Professional and Public Liability Insurance specifically for Explosive Atmosphere Consultancy and inspection and have an extensive and impressive track record of successfully completed projects world-wide. Ex inspections require a method to view and analyse the inspection data to prioritise remedial actions and ensure repeating faults are prevented with root cause analysis. When we conduct Ex or ATEX inspections we will collect data using our unique in-house developed software. The final database will be ‘free issued’ to customers or can be provided for export to other databases or as hard copy (PDF) records. See more on iEx Explosion Safety Management Software. We have our own team of highly experienced and CompEx trained (electrical, non-electrical and Ex design) inspection and remedial action engineers together with qualified Ex Inspection Managers & Supervisors. We can use our people, your people or local contractors (that we will train, supervise and ultimately sign off) for complete flexibility and competitive pricing. We have experience in carrying out inspections and taking the appropriate remedial actions with ATEX, IEC and NEC Installation Codes. Download a short PDF overview of our services for site safety.